High fives and "You go girl! 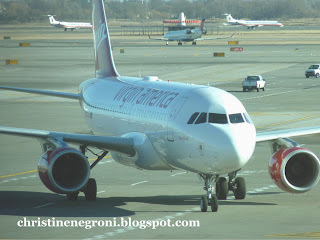 ", to Virgin America for its new safety video that has all the required information set to a rockin' beat. Like Air New Zealand, Southwest and Cebu before it, and fingers-crossed, more airlines to follow, Virgin America is acting on the simple truth that boring, read-by-rote pre-flight briefings are the white noise of air travelers. No one is listening. To be sure, Virgin America's 2007 attempt to amuse while informing seems to have gone terribly wrong a bad combination of too-subtle humor delivered by a deadpan announcer who had me snoozing within the first 30 seconds. Not the case this time. In the new five minute video, the beat is pumpin' and the joint is jumpin' as a variety of cabin crew members and passengers do the unthinkable in commercial aviation today, be serious about safety and have fun at the same time. I write this having just flown with an airline currently in crisis over its planned merger with another U.S. carrier. I'm going to withhold the name because, gosh darn it, I just can't kick them while they're down. Anyway, its not important to the story. This trip involved four flights. On not a single one of them did the flight attendant greet me at the door or even make eye contact. Throughout the flight on three out of four, I never saw any one of the cabin crew smile at all. The safety briefing was a video punctuated by a soundless seat belt and floor lighting demonstration. Those folks weren't having fun. Looking around, I can confirm passengers weren't either. Airlines can decide they're going to compete for customers based on having the lowest ticket price and vast numbers of passengers are locked into their airline decisions based on loyalty programs. And yet, in an interview with Rick Garlick, an analyst with J.D. Power & Associates the other day, he told me the smart companies are realizing "There's a financial return in providing a positive customer experience," for a reason I had not fully appreciated. It's not all about wooing new customers, though there is that. It is also about getting the folks already on board to enjoy themselves because happy passengers are "more likely to buy ancillary services". In an industry where aggressive airlines can earn twenty percent of their revenue from al la carte fees (thanks Jay Sorensen at Idea Works for the stats!) you can see the return on investment in making passengers happy. I would have to vote with Patrick Smith on this one. Especially his line about "the fine print". The purpose of the video is to inform or transmit information not a comedy skit. Making it memorable sometimes helps. However it should be about the audience not the performance and this video has a hint of self-absorption. A thirty second TV spot selling diet soda is one thing, the safety video is another. Additionally it seems a little "YouTube-ish". Mostly I think it sends the wrong. message. Boarding an airplane these days is like walking into a funeral home. Same solemn atmosphere and desire not to be there. So anything to pep up the energy level is a good thing. Not sure the solemn, Gregorian chant style safety demonstration - particularly the animated ones - is imparting information any better than Virgin America's video. I had the same experience as Christine on a recent trip to New Orleans on - I'll say it - Frontier. I used to look forward to flying with them, but now I'd rather chew glass. Sullen flight attendants who, as Christine experienced on her flights, don't even say "hello." Perhaps in some respects the public deserves what they got. Have you seen how people act when they fly? How they dress? How much caca they schlep onboard?